Is it up to the group hosting which way one throws the toggle? or is there something in the TTrak Bible that forbids old school? the short answer to your question is 'no'; and nothing in , either a 'T-TRAK Bible' or recommended practices forbids DC operations. 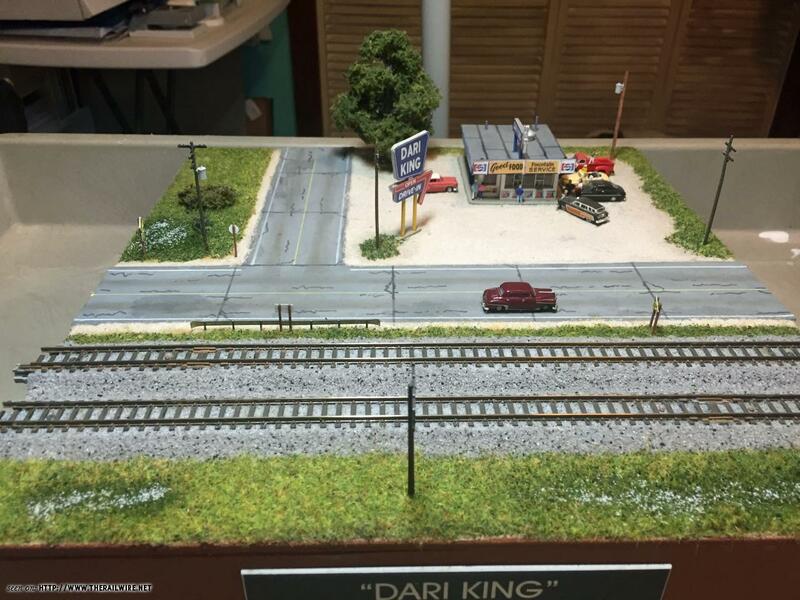 In fact, at most public shows, our local group likes to operate one track with DCC, and the other with DC. 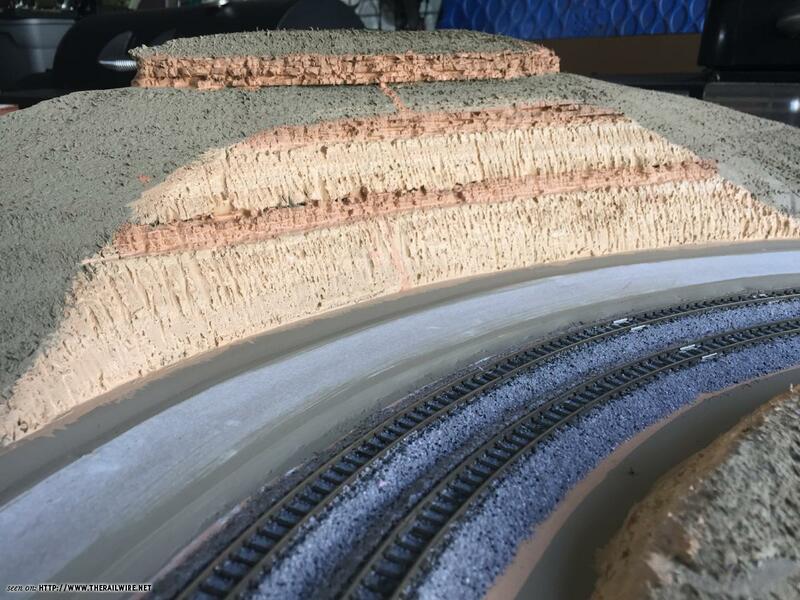 This allows us to, not only, cater to both types of folks who want to run their trains on the layout, but also gives a 'talking point' when we're describing T-TRAK to folks not familiar with the concept. When we are set up in a layout that utilizes only a single row of modules (such as against a wall), using balloon modules to return one track onto the other, obviously we can only use one power system. 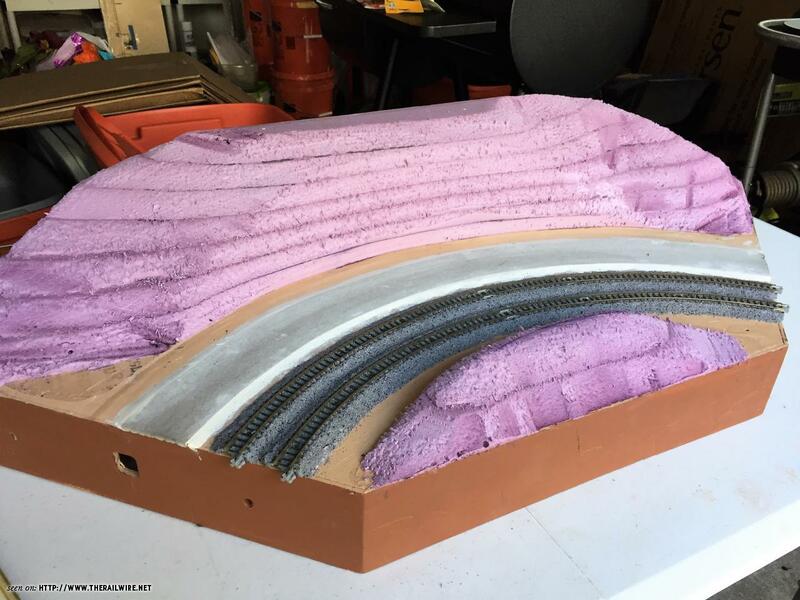 Since the standard wiring for the modules is opposite polarity to each other (what is referred to as "BWWB"), using a balloon loop to direct trains from red track to yellow track, requires no special wiring. BWWB wiring refers to the order and color of each wire to each rail on a standard T-TRAK module. Using the standard Kato Unijoiner wire, the rails are wired, as they appear from front-to-back, with Blue wire to the front rail of the front (RED) track-White wire to the rear rail of the front (RED) track, White wire to the front rail of the rear (YELLOW) track, and Blue Wire to the rear rail of the rear (YELLOW) track...this creates the BWWB order while viewing the rails from front to rear. Obviously this means that the tracks are electrically opposite of each other; this was designed to allow a single person, using a single power source/throttle, to operate two separate trains in opposite directions for visual interest. This standard remains in place and always will. As this configuration prevents using crossovers to switch tracks, many clubs have opted to wire their modules in a BWBW configuration, allowing them to 'operate' when set up together. While this would appear to create problems between one club and others, it's really simple to temporarily convert a BWBW module to BWWB standard, or vice versa. Simply alter a standard Kato DC extension cord to reverse the wires, then plug it into the YELLOW (rear) track connection. This creates a standard BWWB configuration on a non-standard BWBW-wired module, or converts a BWWB to BWBW. When the large set up is over, simply unplug the 'reverser' cord, and the module can revert back to its original wiring. Otherwise, BWBW-wired modules can all be grouped into a separate 'leg' and the YELLOW track can be reversed at the bus. Basically, no matter how individuals, or groups, like to operate at 'home', a T-TRAK module can easily be converted to operate with other modules that may have opposite wiring. 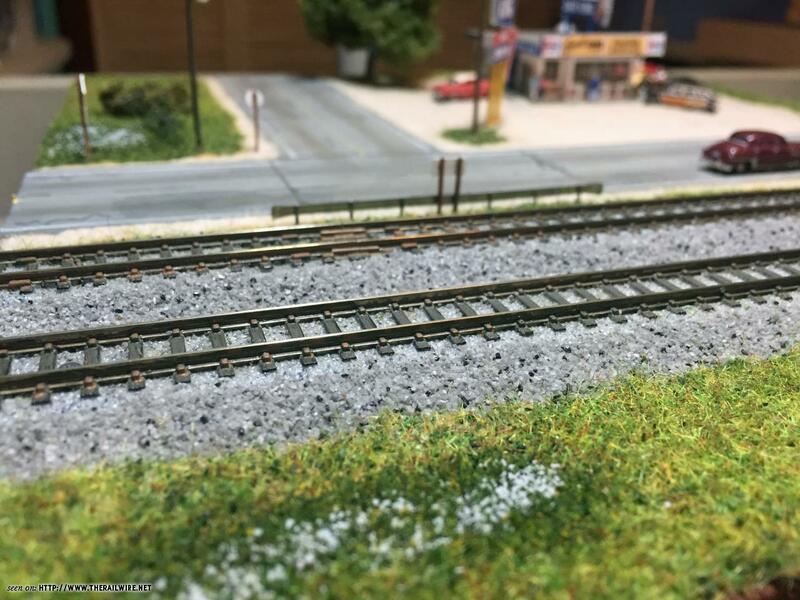 something else I've used T-TRAK modules to test/try, are my personal experiments with static grass...I've been slightly disappointed with the look of a lot of past attempts-while the static grass 'works', it never seems realistic to my eye. There's not enough randomness and difference in color, height, spread/arrangement. I want to add, at least, one more layer of a tall grass, in small clumps, in various areas, to replicate overgrown tall weeds/plants. 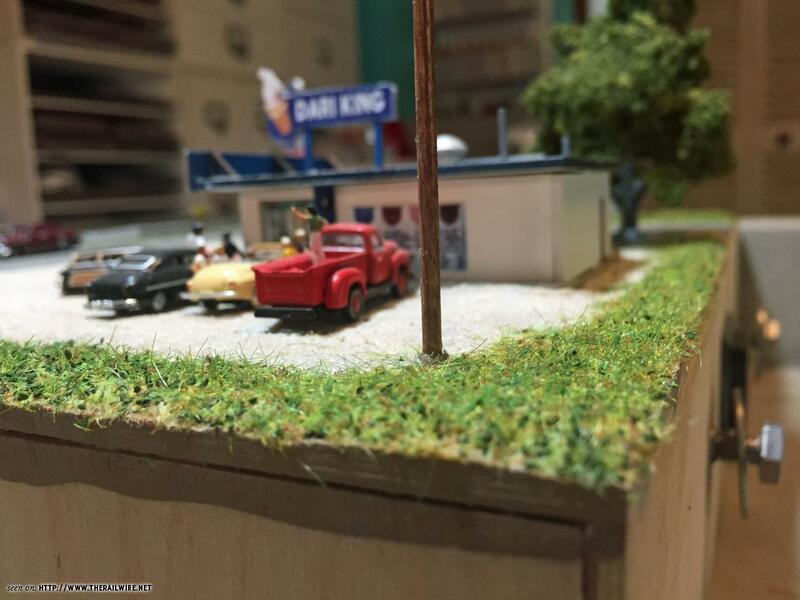 Now that Woodland Scenics has added a new line of tall grasses, I think I'll give them a try. They seem to be a little thicker, which will work toward providing some variance. 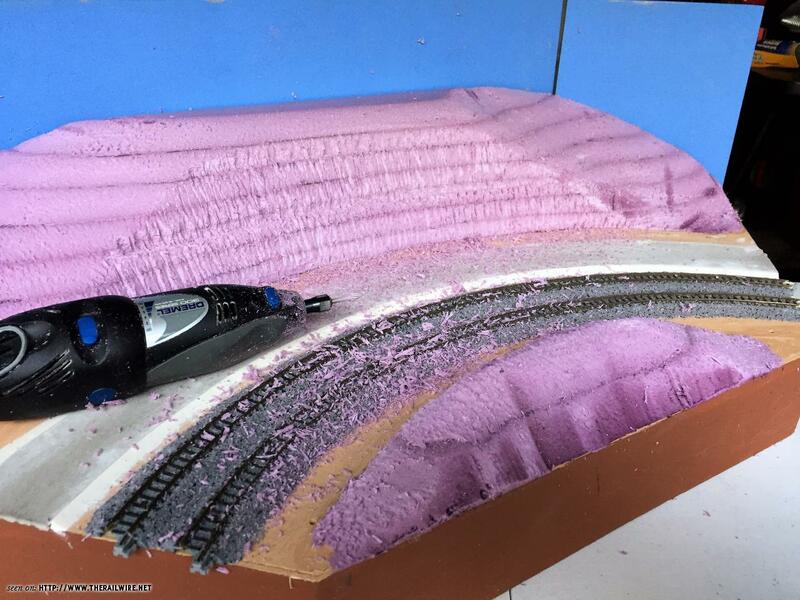 This inside corner module was an exercise in foam carving/sculpting. I wanted to test some foam sculpting techniques; mainly, trying to see if I could get a way with using bare, carved foam as my scenery base. Bruce, that is truly fantastic scenery. I'm hard pressed to tell the difference between the real thing and your work. some issues I have. 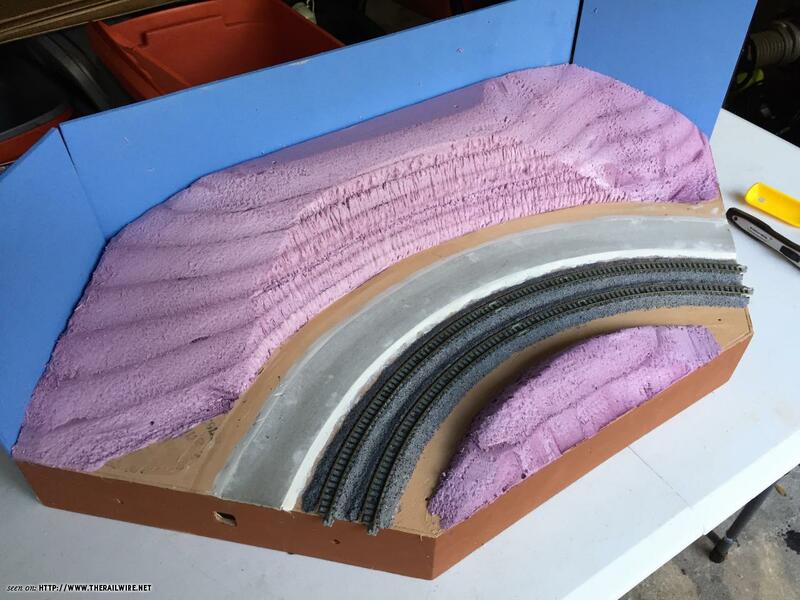 Also how you get away from the toy train look of the track and the gaps between modules. This starts looking like The Monkeytown Model Railroad Club patchwork quilt thing - Very toy like. How to you do Ed, Caleb and Chris in this? Sunken smaller siding to an industry sunk is mud? Who says you need to use Kato turnouts for any part of a T-TRAK module? The T-TRAK standard only requires Kato Unitrack at each end of the module; providing the means of interface/connection to adjoining modules. Many, many T-TRAK modules make use of flextrack between the ends, and for any other track, including spurs, sidings, etc. As far as the tiny gap (generally 2-4mm) between modules, it is a necessary result of the 1-2mm 'overhang' requirement; insuring that, despite irregularities in module construction, that the unitrack will always be positively connected. This is important because the unitrack is the only thing that connects the modules; there are no clamps, etc. Unless your particular club/group/individual builds all of their modules to a continuous and flowing 'theme', then, a T-TRAK set up, obviously will display a 'patchwork' of modules. 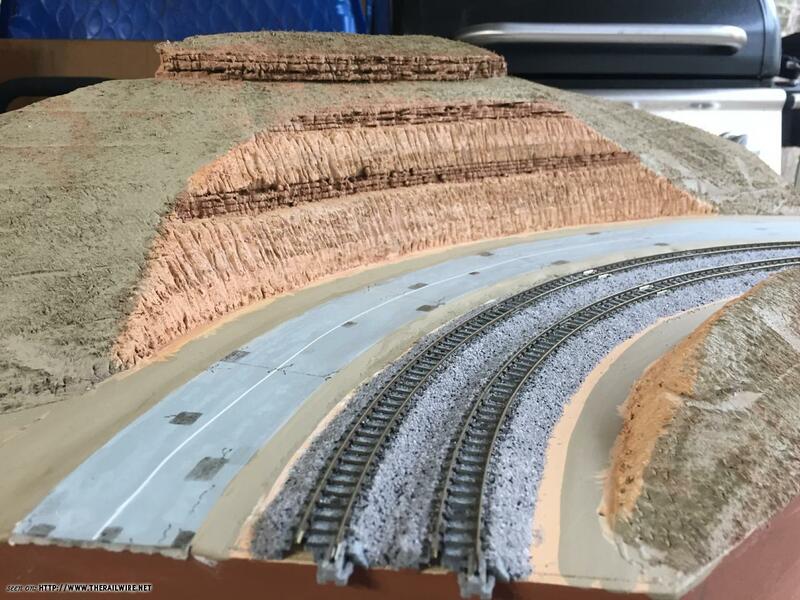 If one sees these as an issue, then T-TRAK is not for you...NTRAK, FreeMo-N, and all other international/national modular standards will have the same issues, when displaying with other groups in a large layout. 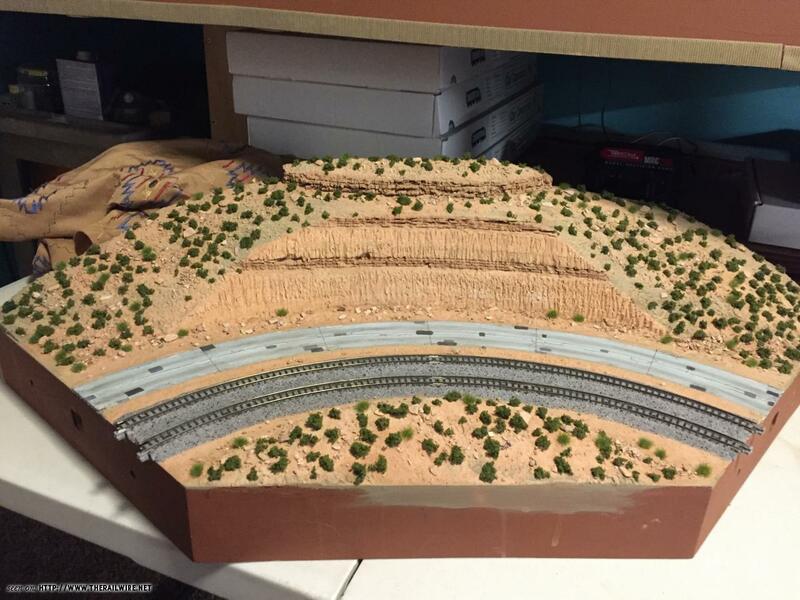 You can certainly call a large T-TRAK layout, and even certain individual modules 'toylike', but the fact is, all of these folks are building and participating in model railroading, as opposed to NOT participating. 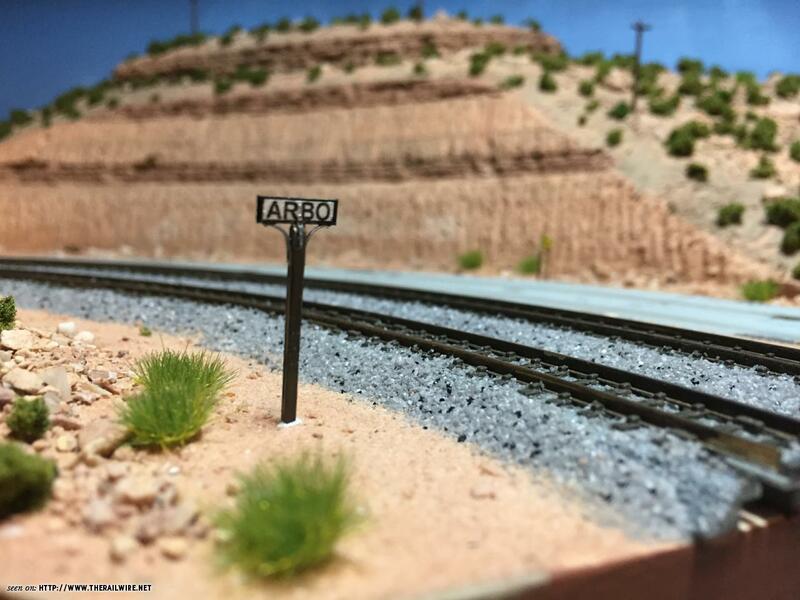 In all of my years in the hobby, I have NEVER seen more folks become interested, inspired, and actually participate, because of any modular concept, as I have in the few years I've become involved in T-TRAK. This is simply because anyone and everyone can participate, of almost any age. I'm witnessing a massive influx of youngsters to this hobby, due to T-TRAK exhibits. 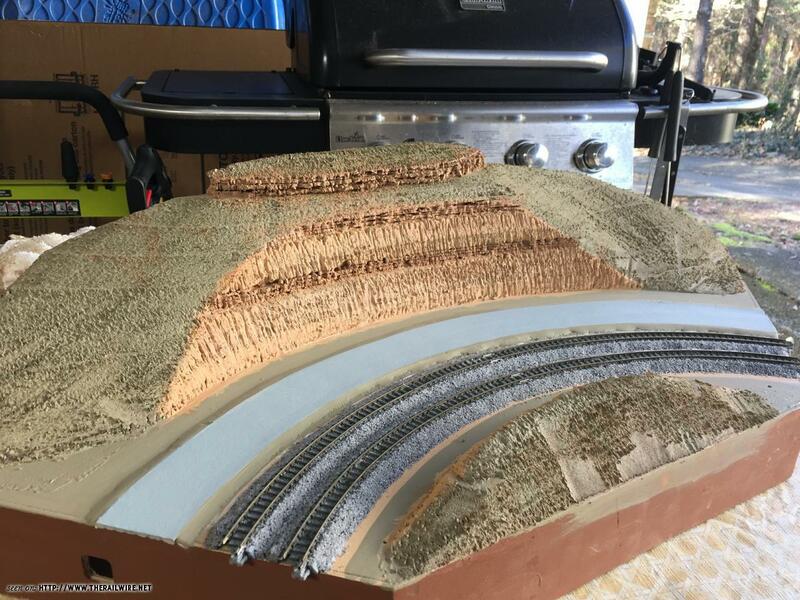 A teacher in Flagstaff, each semester, has his students build T-TRAK modules for credit, connecting them, at the end of the semester, together to run trains for their final grade. 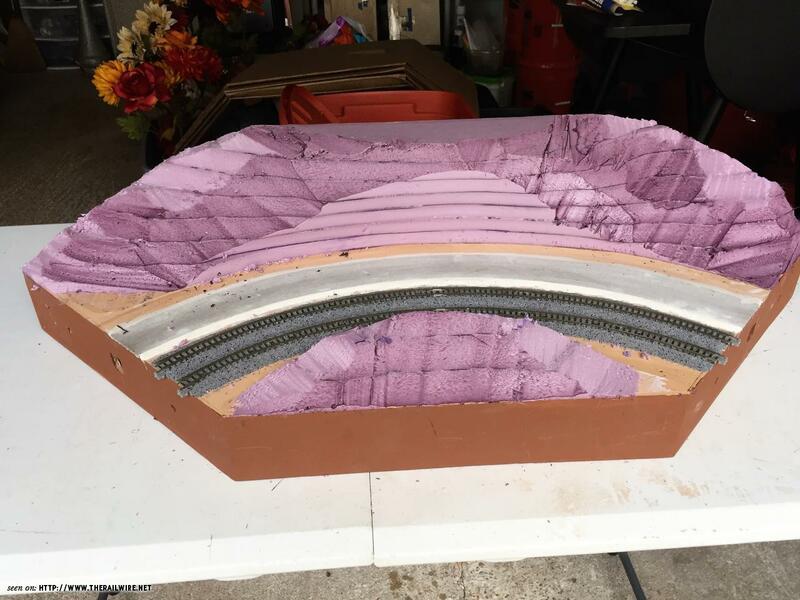 In 4 regions (That I personally know of) scoutmasters offer T-TRAK module building (and subsequent operation) as a means of achieving their railroading badge. 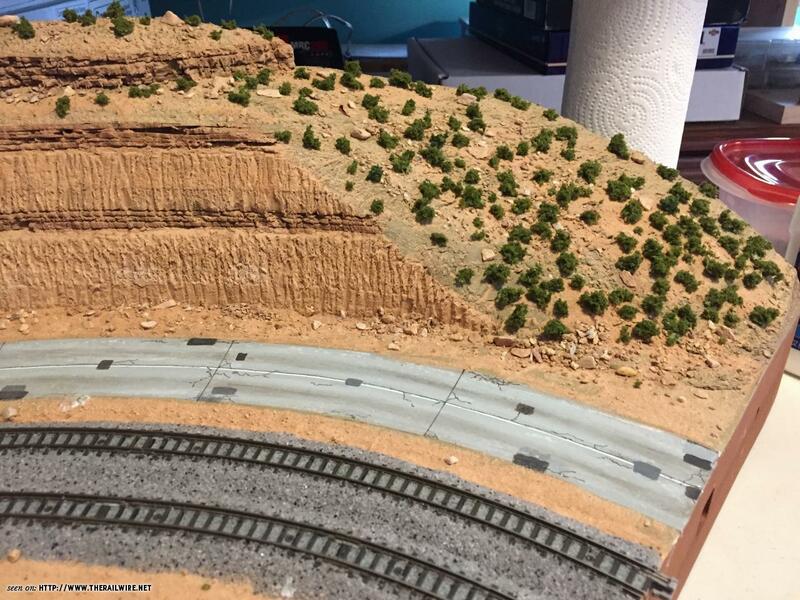 The Colorado Model Railroad Museum (Greeley, CO) is starting a T-TRAK program for underprivileged youngsters. 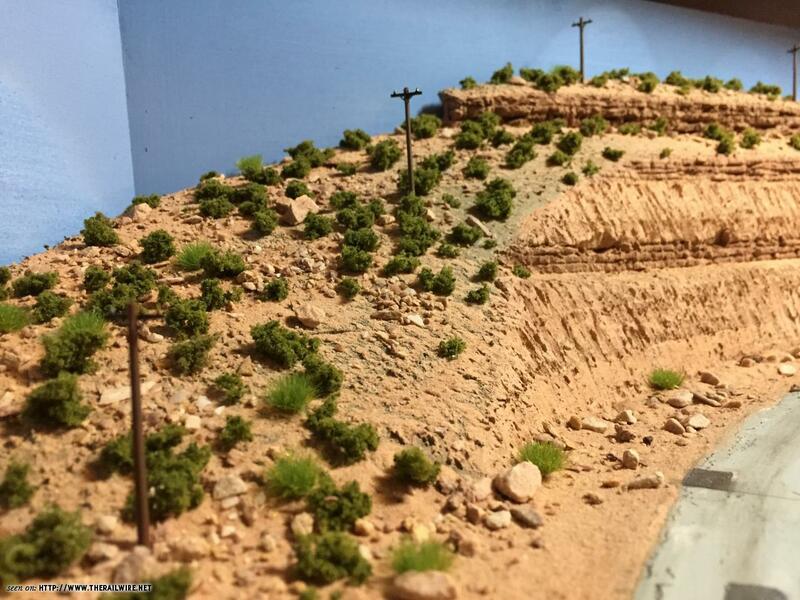 As far as modeling 'track-on-ground' as opposed to track on roadbed, as it applies to spurs, yards, etc? 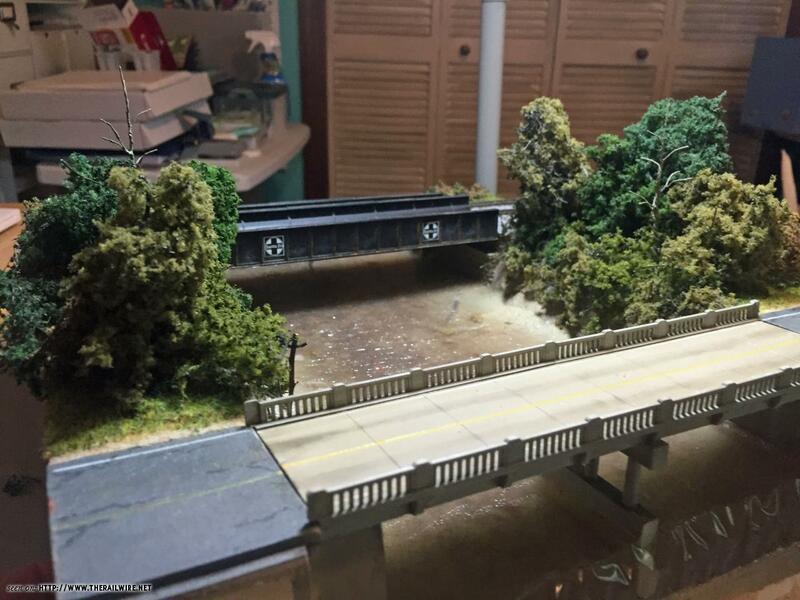 How does one model this on any layout? Why is T-TRAK any different than that? I have a couple of modules with turnouts, coming off of the elevated(Ballast) mainline, to spurs with track at ground level. It's no different than modeling on a fixed layout. 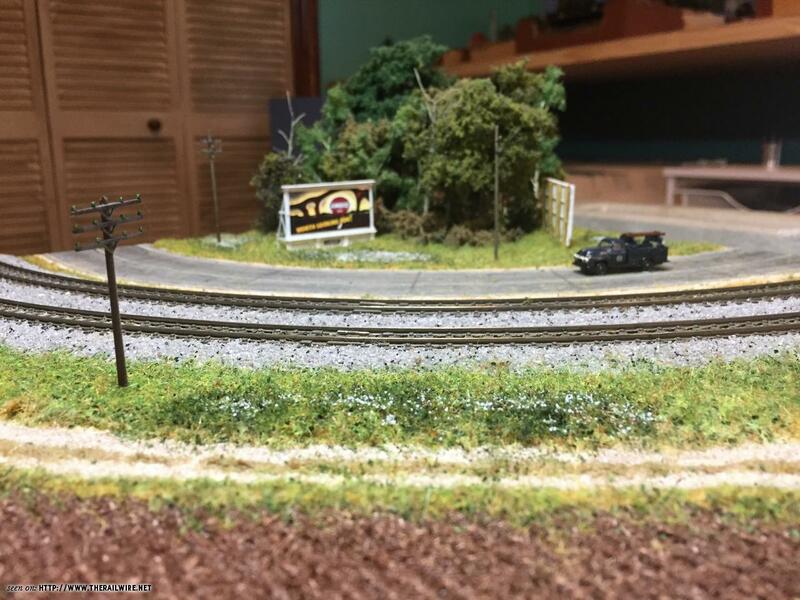 Kato, in conjunction with Woodland Scenics, is , indeed, going ahead with their T-TRAK module kit, in both single and corner styles. Pre-production samples were built and critiqued this last fall. All of these models are smaller than the real thing. Very toylike, the lot. I've seen a number of the modules at a few different shows and they look like folks are having fun and more than a few of them are quite masterful modelling examples. I haven't participated yet but probably will. How to you connect flex track or turnouts to Unitrack? What code Flex track?, do you have to use Code 80, is that what matches Kato Unitrack? I wasn't trying to be snarky, I just can't look past the miles and miles of Unitrack double track mainlines, which is all I see. Once you pull the Kato joiners off the Unitrak, you can use a regular joiner to transition to Code 80 or whatever size rail you use. I've seen the absolute smallest piece of Unitrak used at the ends then whatever track the owner used. Cork lines up with the Unitrak base well. Any transition to a siding would be handled as you would normally do. Apart from the modules I mentioned above, I DO tend to use Unitrack throughout my modules as I consider them 'promotion' modules. For the same reason, all structures, featured on my T-TRAK modules, are built OOB with no modifications, helping to advertise the manufacturers. Everyday, and at every show I'm involved with I meet folks who have had an ill-informed, or uninformed view of T-TRAK; or had made assumptions that everything T-TRAK is 'toy-like' or something less than scale modeling. 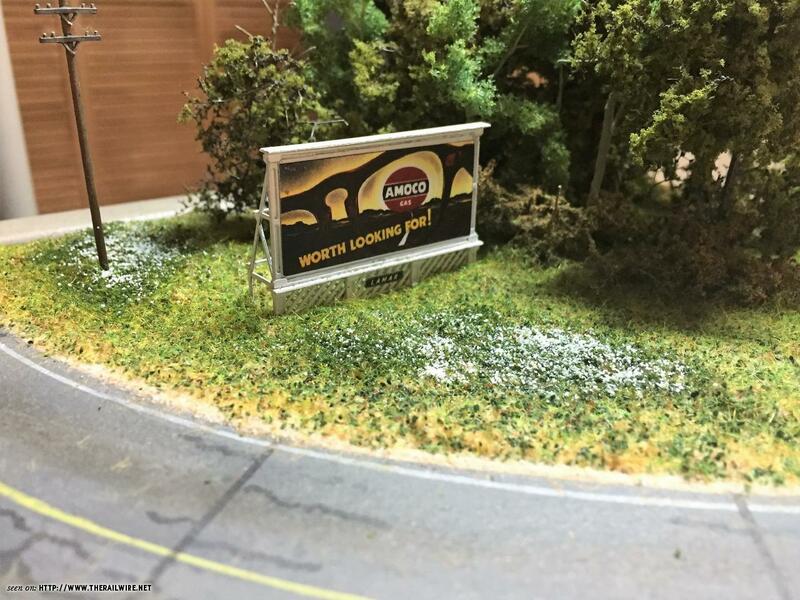 The fact is: many T-TRAK modules, indeed, could be considered 'toy-like', or 'whimsical' (personally, I'm not a fan of 'whimsy' in my model railroading), but I support anyone and everyone in what they want to put on their modules, because, at the end of the day, they're participating in model railroading! Again, I've never seen a concept that appealed to so many different age groups, and different levels of modeling ability. 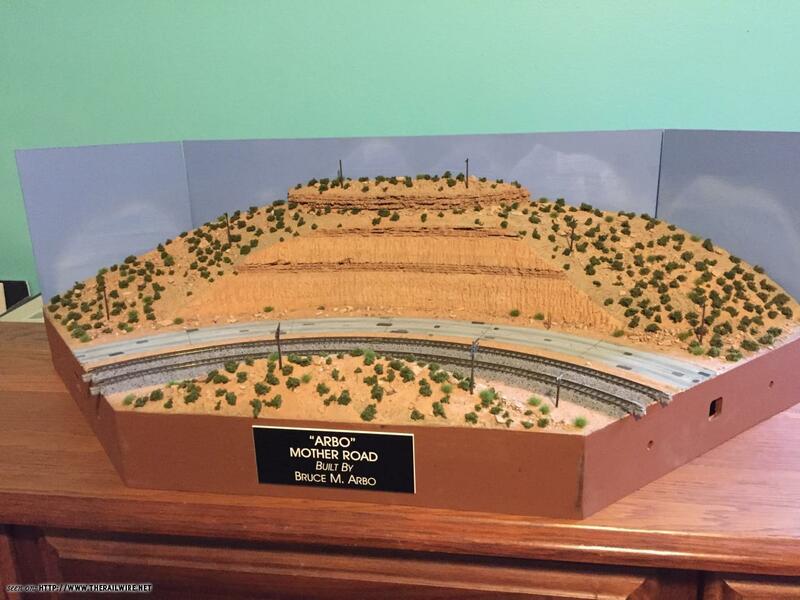 Of course, I model for myself (I don't put 'car wrecks', or 'mooners', or other whimsical stuff, on my model railroad), but it wasn't hard to see that this 'new to me' concept appealed to everyone, and could be done much more simply, and inexpensive, than other modular concepts, NTRAK also allows each modeler to 'do their own thing', and, to a lesser extent, so does FreeMo-N, but the size of the modules, and the fact that they are set up on tables (or any flat surface) is an obvious appeal to entry level modelers. 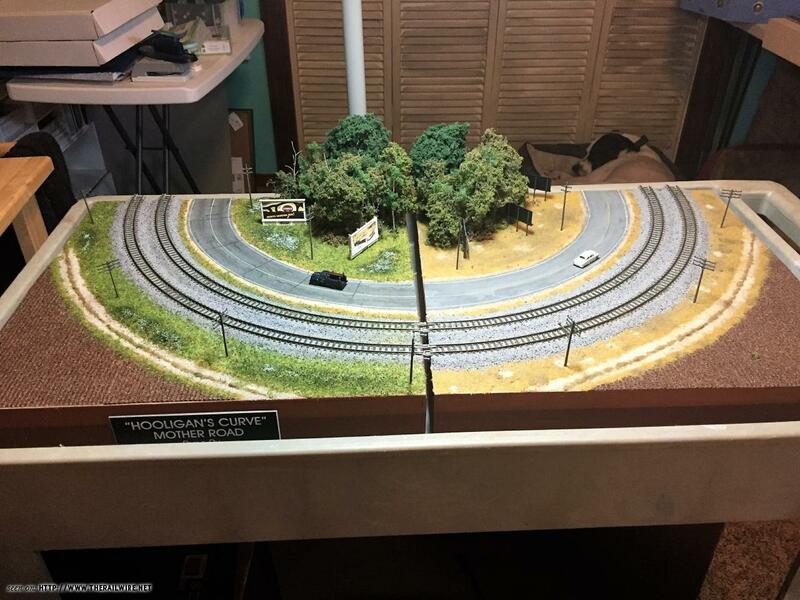 And, although i'm still a code 40/55 scale snob, I've had more fun organizing and participating in T-TRAK layouts across the country, than i have ever had in any other scale railroad modeling concept. Where some see only limitations, others see only possibilities. Some people see fun and others want to drag the fun out to the woods and kill the fun. T-Trak is fun. "Serious" people only want angst.